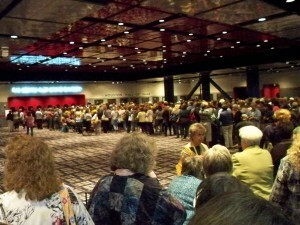 International Quilt Market – Sample Spree!!! 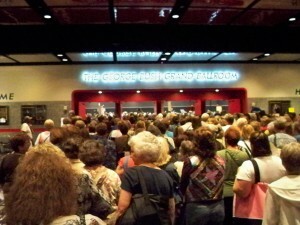 One of the most chaotic, but fun events at the International Quilt Market is Sample Spree. It takes place at the end of a long day of classes at Schoolhouse and the day before the Quilt Market Exhibit opens. Sample Spree is not for the faint of heart. Sample Spree is an opportunity for all to buy products below wholesale prices. It’s a way for manufacturers and publishers to get their goods into the hands of the store owners at a very reasonable price. Of course, the hope is by putting their products into your hands, you will buy more. A Sample Spree veteran knows that getting there early is key. 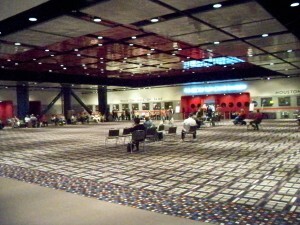 It’s held in a big ball room at the George R. Brown Convention Center. We arrived an hour early and there is where our position in line was. 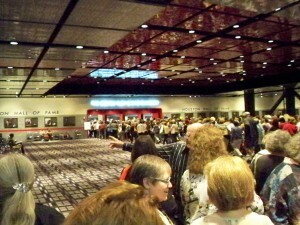 This is how long the line was behind us before the doors open. 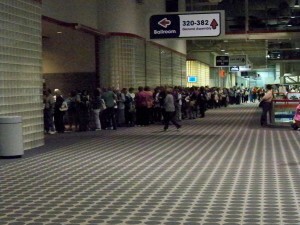 There actually are 2 lines, both meandering down the convention center hallway in both directions. It’s a festive atmosphere. You immediately bond with your fellow Sample Spree attendees. 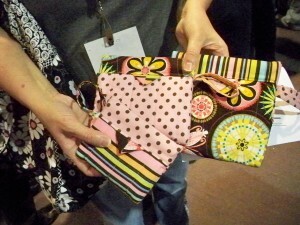 You admire each others totes, and projects get pulled to show your new BFFs what you have made. No wonder Carole and Barb look so happy! Then suddenly, the noise level rises and the doors open!!! Inside the vendors are just as excited. Their flashes are popping as they take pictures of the excited shoppers. We are getting closer. it only takes a couple of minutes to get in…but that Moda table is calling us. And chaos ensues. I was so busy scoping out the deals, this is the only picture I got once inside the room. I have no clue whose table it was; I just know there was an excited crowd around it. When I was done with my shopping, I found this scene outside the ballroom. There is a smattering of people waiting to get in. 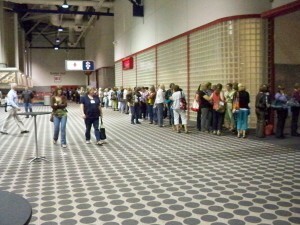 These are the poor individuals that neglected to purchase a Sample Spree ticket early on. They are on “stand-by”. But the majority of the individuals are the patient spouses guarding their loved ones treasures while they shop some more. Here’s a sample of what treasures I got! Some great fat quarter bundles from Warm Fabrics, full 1 year lengths from Art Gallery Fabrics (our own Jen Eskridge is helping them produce their patterns), and finally some Snap Sack Kits…each bag contains a full kit…fabric and pattern. My haul was small compared to some shopper’s…..very small. Sample Spree is an experience one is not likely to forget. 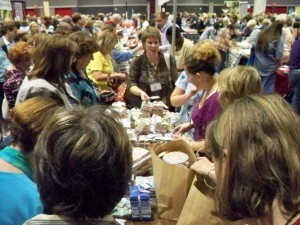 It’s fun, a chance to commune with your fellow quilting enthusiasts, and a great chance to replenish your stash. If you ever come to Quilt Market, it’s a MUST DO! 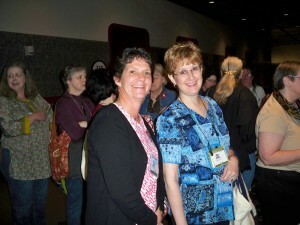 This entry was posted in Quilt Market and tagged Quilt Market, Sample Spree. Bookmark the permalink.